I have dipped my toe into the world of tube (or valve) audio. The first thing that I learned was that in general, tube amps are expensive. It seems that the least expensive amps run about $1,000 US, and from there it seems the sky is the limit. There are a number of less expensive Chinese versions floating around, most of the tube audio experts call them garbage. Myself; I am not so sure. There are also a lot of somewhat dubious claims made by the same experts about speaker cable, AC power conditioning and so on. 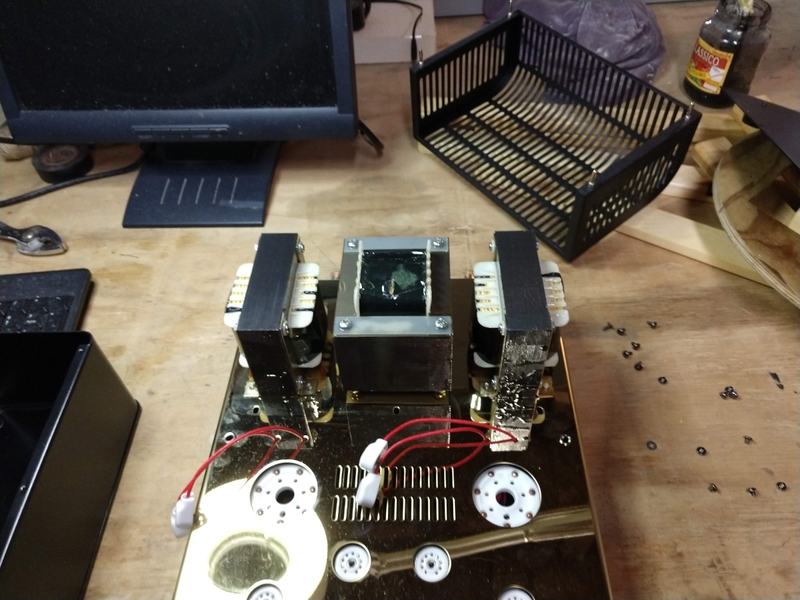 That is a whole series of videos, eighteen in all I think, on the design and construction of a single ended KT88 audio amp. If you have the time, well worth it to watch. That is the Chinese version FU-29, there is also a Russian радиолампа ГY-29. The good news is that there are lots of these tubes available for not too much money. New Old Stock (NOS) RCA 829Bs run about $25-30 each. A Ulyanovsk GU-29 (NOS) runs about $10.00 (made in the USSR). Somewhat more rare are the 3E29 tubes, which were designed for VHF pulsed radar. These are dual pentode tubes which can be run ether parallel (single ended) or push pull. They were originally designed for VHF transmitters, but have been put into use in HF transmitters and audio amplifiers. The USSR versions are long life militarized versions and designed for aircraft radar; flying upside down at Mach 2 in -50 C temperatures 18,000 meters AMSL… My Russian friend tells me I am joking. I am joking. 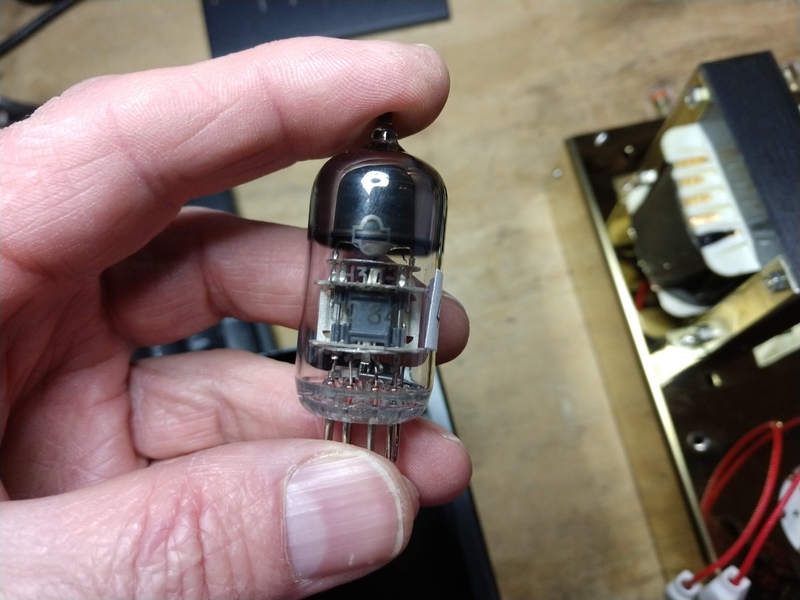 The driver tubes and phase inverters are 6N3P-E (6N3, 6N3P, 6N3P-EV, 5670, 2C51 or 396A can also be used) which is a double triode tube, made by Reflector in Sartov, Russia. These tubes are also militarized long life versions. The Audioromy M-828A amplifier seemed like a good compromise between price, power and workmanship. I ordered the amp from Amazon and it took about a week to arrive. The first thing I did was take it apart and look at it. I was expecting poor workmanship and cheap components, etc. Overall, it seems to be pretty well made. There are two printed circuit boards; one for the power supply, the other for the front end before the two power amp tubes. 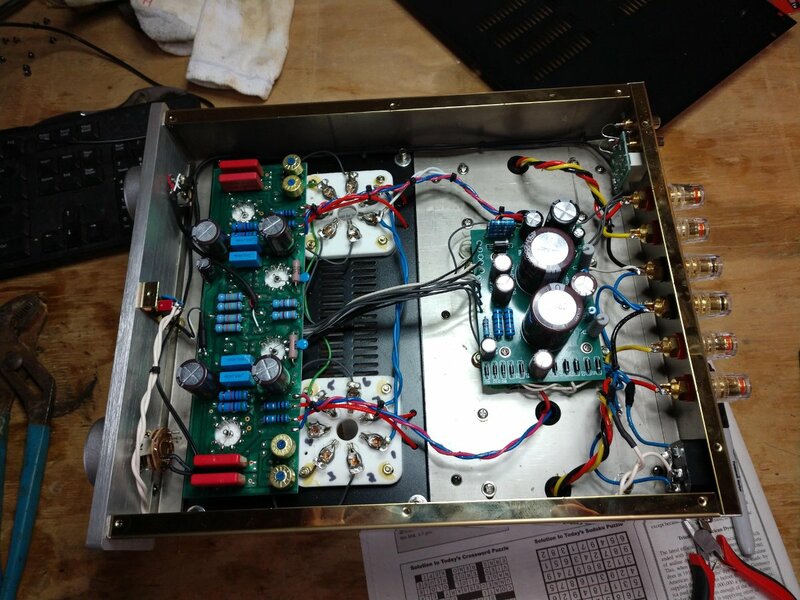 The power supply uses solid state diodes, which some view as a compromise to a tube amp design. There are also several power supplies on one board; 440 VDC B+ for power tubes, 220 VDC screen supply, a -25 VDC grid bias supply, 12 VDC for the audio switching relay, +6 VDC for the driver/phase inverter filaments. I like the idea of DC filament voltage on the driver tubes. This amp is configured for push pull and rated at 30 watts per channel. I will test all of that plus measure THD, frequency response and so on. There is no manual, which I find a little bit annoying. Also, there is a lack of a schematic diagram nor any instructions on biasing and balancing the tubes when they are replaced. 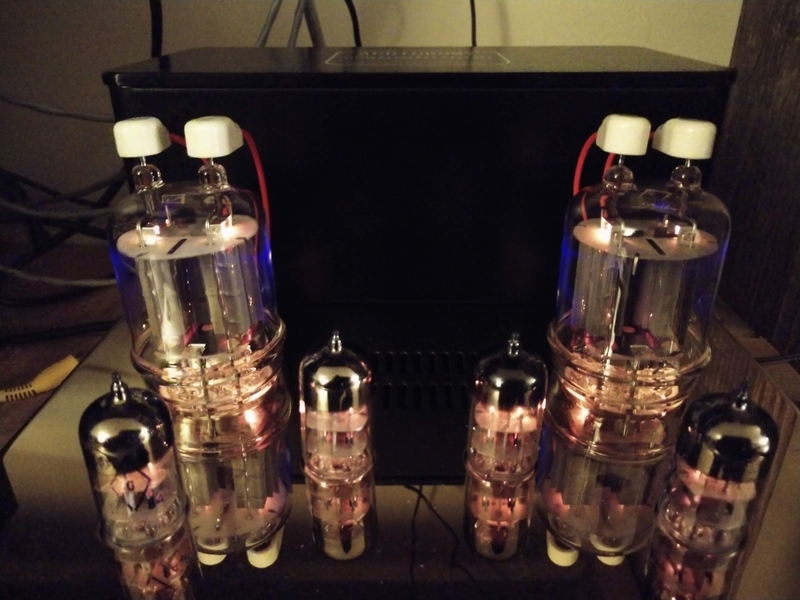 Being thus annoyed, I did some deep diving on the intertubes and found that some people had posted on how to re-bias and re-balance the thing after tube replacement. There where also several modifications suggested. Replace the input potentiometer with something a little more substantial. It does seem to be a little bit cheap and I do not like the notches in the volume adjustment. I will do this mod. Replace the coupling caps with oil filled units. Not so sure about this one, but I might try it just to see if it makes a difference. Install a bias regulating circuit using an LM317 voltage regulator between the output tube cathode and ground. This seems like a good idea. Roll (replace) the input and power tubes with better versions of US made or Russian made tubes. The input tubes are 6N3P-E tubes from Reflector (Sartov, Russia) which are already pretty good tubes. I might replace the FU-29’s with a set of GU-29’s at some point. After all my investigations where finished, I put the amp back together and plugged it in. I then ran my known CD’s though it and it sounded a bit rough. I was a little bit disappointed until someone said that it takes about 10 hours or so for a tube to break in. I connected it to my speaker test load (8 ohm, 50 watt resistors) and let it run for a day. What a difference a day makes. The second listen to the same CD proved to be much, much better. There is definitely some coloration from the tubes. A side to side comparison between my solid state Kenwood VR-309 amp and the Audioromy M-828A has the tube amp sounding much richer. There is no real way to say it; it sounds full while detailed and clean all at the same time. Playing though my homemade speakers, which are mid range deluxe, stringed instruments sound very detailed. You can hear the pick hit the strings on an acoustic guitar. You can hear the bow scrape across the strings on a cello. It is unlike any amp that I have ever owned. I am enjoying very much listening to Dave Mathews and Tim Reynolds Live at Luther College CD as I am typing this. Now, I don’t know what the difference between this amp and the $10,000.00 version of the same tube amp made in Canada, other than the $9,500.00 difference in price. A few comments about this amp and the 829B push pull amp design. First of all, since the screen grids are connected internally, there is no way to run this tube in ultra linear mode. Usually, ultra linear mode involves taking feedback from the output (anode) or the output transformer and feeding it into the screen of the power tube. Secondly, it is widely commented on that these amps are notoriously difficult to bias and balance. One or both sides of the output tube will red plate due to over current. I am hopeful the the LM-317 bias regulator circuit will take some of the difficulty out of this. With an ordinary push pull amplifier, the balancing issue is taken care of with matched tubes. Since both tubes in this push pull circuit are in the same envelope, getting a matched pair is not likely. So, the tricky act of balancing the two outputs from the same tube will have to be carried out each time the tubes are replaced. That being said, hopefully a set of those Soviet tubes will last for a long time. 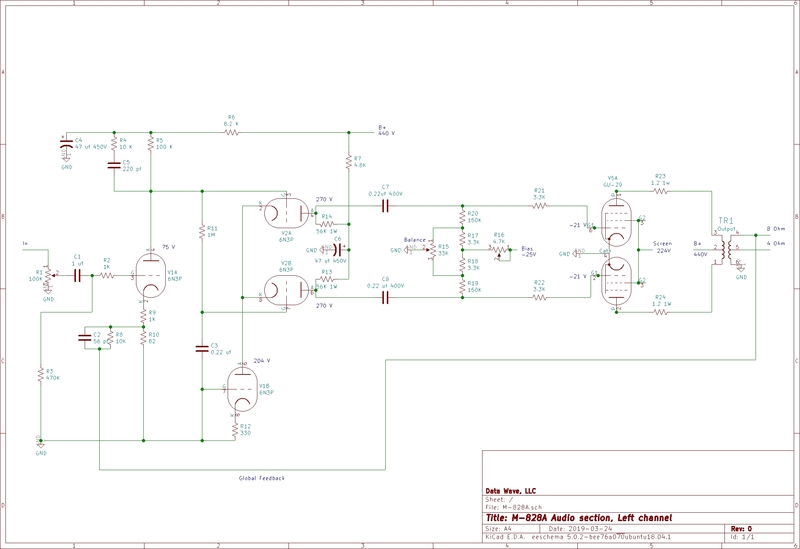 One thing that I did do is make a bunch of voltage measurements and noted them on the schematic diagram. If there are every any problems with this unit, having a set of base voltage measurements should go a long way toward troubleshooting and repairing it. 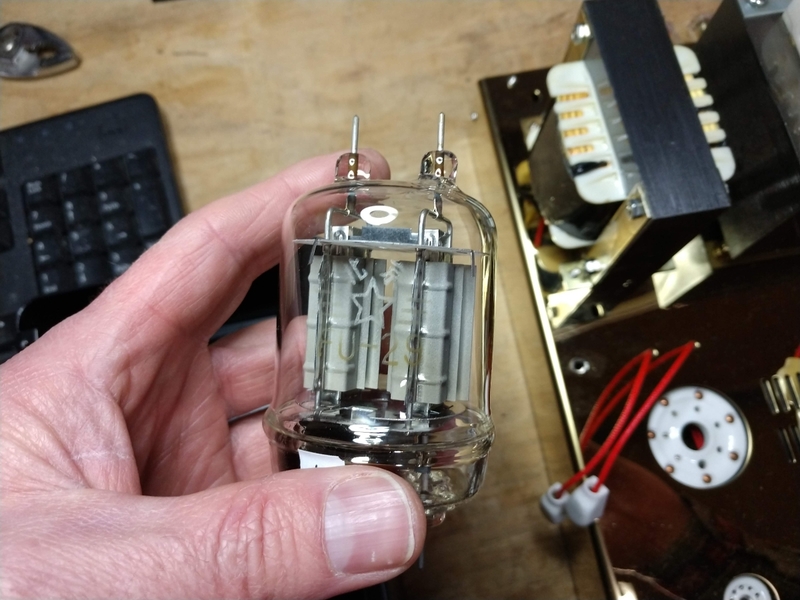 Finally, while the 829B is a rather exotic tube, it likely does not perform to the level of an EL86 or KT88 single ended design. That being said, I have no problems with purchasing this amp and I am enjoying the toob audio sound very much.